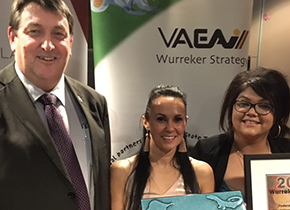 Federation University Australia’s Aboriginal Education Centre has been presented with the Training Provider Award for Innovative Koorie Learner Pathways in the VAEAI Wurreker Awards ceremony. This prestigious award acknowledges the University’s excellence in innovative community driven programs, collaborative partnerships resulting in improved pathways and career opportunities for its students. “The award also recognises our commitment to creating positive and sustainable impact and benefits for our students and community,” Jasmine Graham, Manager of the Aboriginal Education Centre, said. The Wurreker Awards have been conducted annually for the past 15 years as part of the Victorian Government Wurreker Strategy, which focuses on TAFE and VET course provision and employment and career outcomes for Aboriginal and Torres Strait Islander people. VAEAI is Victorian Aboriginal Education Association Incorporated.